Someone gave me a New Guinea Impatiens plant. Now that the weather is getting cooler, what do I do with it? 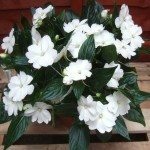 In most cold climates the tropical New Guinea Impatiens are generally grown as an annual. By the end of the summer the plant can be a bit tired and woody. Many people do take cuttings to grow over the winter for new plants in the spring. You can also bring the plant indoors for the winter to take the cuttings in the spring.